A garden bench is always a welcome addition to any landscape project. 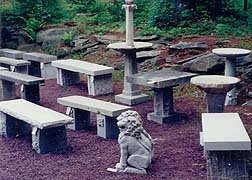 At Ferree Studios we create benches for gardens, landscapes, cemeteries, and parks. Our benches have a functional purpose and add charm and interest to your landscape. Our designs range from the simple to the elaborate. Contact us today about making a bench for your special place.